A Brazilian clown has had the last laugh by winning a seat in Congress with more votes than any other candidate in Sunday's elections. 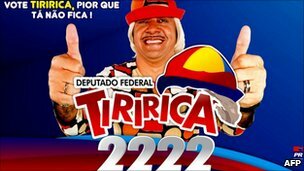 Tiririca, or Francisco Oliveira Silva to give him his real name, was elected as a federal deputy for Sao Paulo with more than 1.3 million votes. Tiririca, or "Grumpy", had slogans such as: "It can't get any worse." Brazil thinks its showing the world up, but we have been electing clowns for years.